The PRC is a wonderful horse boarding opportunity. Please read the following and if you are interested in joining, or have questions, don’t hesitate to contact us at: Membership@Presidioridingclub.com. Presidio Riding Club is a 501(c)3 non-profit co-operatively run organization operating out of the Rodeo Valley Stable in the Marin Headlands. 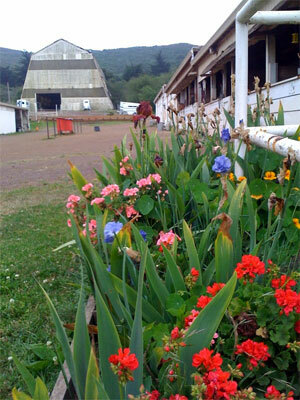 Presidio Riding Club has been at its current location in the Southern Marin Headlands since 1966. PRC delivers all equine-related programs and activities at no cost to the public based on volunteer hours from our active members. PRC has created a culture-of-service that has been integral to its success over the past 48 years, and continues to be a big part of enhancing and expanding on-site public programming. All public programming, environmental stewardship and facilities management is conducted by the PRC members, sponsors and volunteers. Provide top quality care for the horses, preserve Rodeo Valley Stables historic structures, preserve, enhance and educate diverse users of the trails in Rodeo Valley, promote and provide free public access to equine activities by diverse public groups including veterans, students, children, families, and those with the natural challenges of aging. PRC active members include a diverse demographic with backgrounds in a range of disciplines which contribute to PRC's unique ability operate and maintain the stables and conduct the range a wide range of community outreach programs. PRC members bring backgrounds in: Animal Husbandry, Equine Therapy, Environmental Law, Grant Writing, Fund Raising, Non Profit Operations, Construction, Hydrology, Accounting, Insurance, Hospitality, Business Management, Quality Processes, Long Range Planning, Marketing, Graphic Design, Copy Writing, Photography & Web Design. PRC members also bring over 400 years of combined equine experience including specific expertise in: Equine behavior (ARA and CHA certification); therapeutic interaction and non-competitive riding to improve human health and emotional development; teaching ground manners; trail riding, dressage, endurance riding, eventing, reining, show jumping; harness/carriage training; and trail riding, back country riding and back country packing. The PRC membership includes several military veterans: male, female, combat vets and disabled vets - which contributes significantly to PRC’s unique ability to provide meaningful veterans outreach programs which are a key element of PRC’s mission. Membership is no longer limited to active duty or retired military and their family. What does it cost to board a horse at the PRC? The monthly board is about $550 including forage. Members are charged for actual usage of bedding and hay, plus certain fixed costs, so the amount can fluctuate from month to month and horse to horse. This cost includes: private stall, daily turn out; 2 flakes of hay per day, blanketing and AM and PM feed. Members may purchase additional forage or provide grain, which is dispensed as part of AM and PM feed. 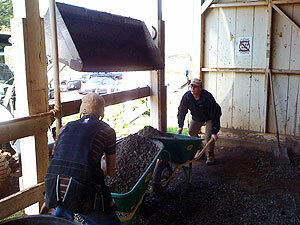 Monthly Saturday “workday construction projects” and to fulfill herd horse feeding, and turn in once every 10 weeks. 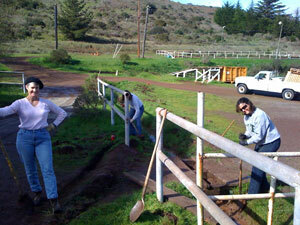 PRC Active Members contribute their time, energy and professional skills to support public programming in the national park and in assisting the PRC in fulfilling its contractual lease and property upkeep obligations to the GGNRA. The PRC is not a show, full-service or training barn. 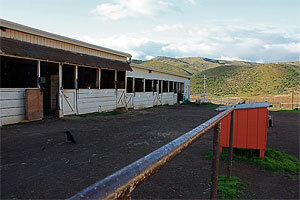 All horses have private stalls at night and group turnout in paddocks during the day. There is no private turnout. The PRC does not offer training. There is an outdoor arena of fair quality which is not usable during rains. All of the PRC facility is open to the public. What kind of horse does well at the PRC? Almost any horse would benefit from being at the PRC, but we find that horses that are well socialized to other horses do best. Horses must have basic ground manners and be safe for the members to handle. Horses should be comfortable being in a paddock with either mares or geldings. The PRC has many visitors since it is located in a National Park. The horses are often petted and, although it is discouraged, sometimes visitors feed treats to the horses, so horses boarded should be used to people. The PRC does not allow stallions, pregnant mares, or horses under the age of two in the herd. Horses are introduced into the herd over a period of time using a staged process to reduce possibilities for injuries. There are no specific breed restrictions. What kind of equestrian experience do I need to keep a horse at the PRC? Members must be comfortable handling horses. 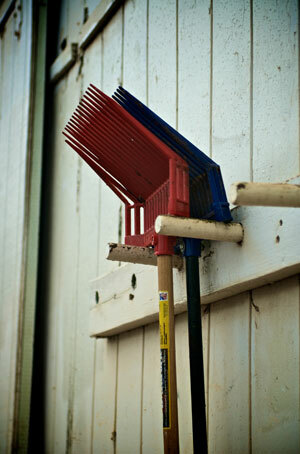 You should be able to comfortably handle other horses as well as muck, feed and care for your own horse. It is possible that any PRC horse owner may encounter a wide variety of situations requiring appropriate emergency action. Examples include: multiple loose horses, broken fences, horse or human injuries, etc. PRC members depend upon each other to identify and respond to such problems. 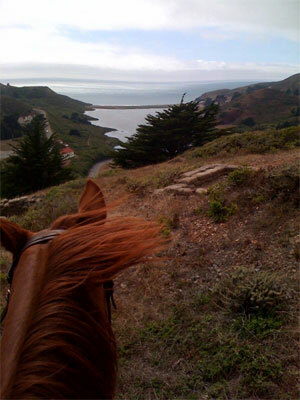 The GGNRA trail riding opportunities are varied, spectacular and scenic. There are many miles of trail available -- with views of San Francisco and the Golden Gate Bridge, the ocean, and the coast. What is expected of boarders at the PRC? 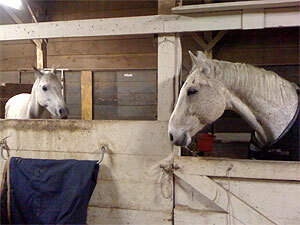 Horse care: Regular basic grooming, hoof care, exercise. Monthly workday the second Saturday of every month. Sunday feeding, turn-in and paddocks once every few months. If PRC sounds like the right place for you and your horse, you can send an email to: Membership@Presidioridingclub.com. The PRC maintains a waitlist to board – you must be a member to be on the waitlist. Membership dues are $10 per month. The NPS limits boarding to 13 horses, so new boarders are allowed as spaces open up. The information above is designed to help you make an intelligent informed decision about applying for a PRC spot. Again, if you have further questions, don’t hesitate to contact us. Thank you.